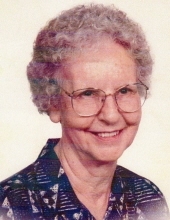 Jewell Laura Spears was born November 21, 1921 in Turley, Missouri to Thomas Howard and Nona Long Duff. She was united in marriage on February 14, 1940 in Fort Scott, Kansas to Roy E. “Buster” Spears. To this union three children were born. Jewell was preceded in death by her parents, husband Buster Spears, daughter June Davidson, two brothers, one sister, and son-in-law Barney Goddard. She is survived by her son Gary Spears and wife Sue of Lawrence, KS, daughter Carolyn Goddard of Independence, MO, nine grandchildren, eight great-grandchildren, and four great-great-grandchildren. To send flowers or a remembrance gift to the family of Jewell Spears, please visit our Tribute Store. "Email Address" would like to share the life celebration of Jewell Spears. Click on the "link" to go to share a favorite memory or leave a condolence message for the family.